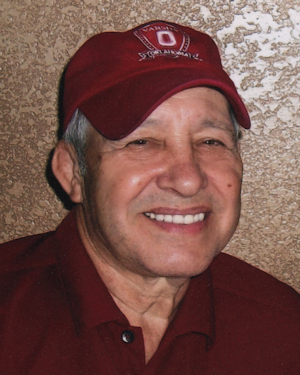 Obituary – Macias, Michael Anthony “Tony” « Perry High School Alumni Association, Inc.
Football 55-58; Wrestling 55-58; Track 55-57; Wrestling Co-Captain 56-57, 57-58; Teen Town Council 55-56; Lettermen’s Club 55-58; Assembly 55-56; Regional Champion 55-58; Geary Champion 57-58; State Champion 56-57. Tony was born October 24, 1938 to Emilio and Mary (Terronez) Macias in Perry, Oklahoma. He grew up in Perry and graduated from Perry High School in 1958. On August 3, 1957, Tony married the love of his life, Marilee Gantt and they were blessed with 60 wonderful years together. Tony came from a humble background but always with the desire for knowledge and building a better life for his family. He earned a full ride wrestling scholarship at the University of Oklahoma where he earned All American Honors at 123 lbs. 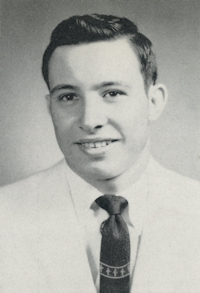 on the National Championship team of 1960. While in college, he started the Noble wrestling program in 1959 where their practice facility was a mat in the Jefferies brothers’ garage. He graduated with a Masters from Central State College in 1969. Tony started the wrestling program at Southeast High School in OKC where his teams were State Runners-up twice before winning their only State Championship. His tenure at Southeast, plus one year at Guthrie, lasted from 1967-72. He made the jump to college coaching at Southwestern Oregon Community College in Coos Bay, Oregon. In his first year, he coached them to their first winning season, and ended the season 14th in the nation. Tony received a call from Eddie Parker to buy the Kumback Lunch which he has owned for the past 41 years. Tony was partners with Clem and Opal Yockey at the Sooners Corner Complex for 27 years, owned Cedar Junction Convenience Store for many years and ran Cherokee Strip restaurant for two years. Tony was a man of many talents and interests. He built his own home and four other homes in Perry and as a hobby he made jewelry for family and friends. He was a businessman and wrestling coach who loved helping others. Tony loved to travel with family and friends. Taking his family to Disney World and OU Football Championship games were his favorite times. He loved playing with his four granddaughters and was proud of all their accomplishments. He was proud of his daughters who he also taught to operate the Sooners Corner Restaurant. As one friend stated, Tony routinely took part in random acts of kindness. He always gave his heart and hard-earned money to everyone, especially people in need. Tony and Marilee’s home was always open to wrestlers and friends who needed a place to stay, as was proven by several young men they raised in their home. As those young men matured, they admired Tony as a father fiqure. Tony loved his family and supported each member fully. Their priorities were his priorities. He was great at all competitive sports and loved each one he participated in. Tony was born with God given talent, developed it through hard work, and was proud of his accomplishments. He was a great All American athlete, State Champion Wrestler, Coach, successful businessman, mentor, friend, loving husband, father and grandfather. Tony’s hobbies were playing golf with friends, traveling to foreign countries, and going to OU football games. He can be remembered as a friend of many talents who loved to help people. Tony is survived by his wife of 60 years, Marilee, of the home; two daughters, Michelle Cain and husband Monty of Edmond, Ok. and Melissa Finley and husband Bradley of Perry, Ok; four grandchildren, Jordan Cain, Haley Cain, Madison Cain and Taylor Finley; two brothers, Raymond Macias and wife Marie of Piedmont, Ok and Leonard “Butch” Macias and wife Cheryl of Guthrie, Ok; two sisters, Josephine Woodard and husband Bill of Guthrie, Ok and Helen Macias of Yukon Ok; numerous nieces, nephews and cousins and a host of friends. He was preceded in death by his parents; brother, Richard Macias; and sister, Dela Smith.